I admit I went to the National Gallery dragging my feet a little. I have never been particularly enamoured of Canaletto, nor of Venetian view painting in general, their paintings seeming at times very repetitive and in many cases mediocre. This was a mistake, an absurd prejudice, which this remarkable exhibition at the London museum amply demonstrates. 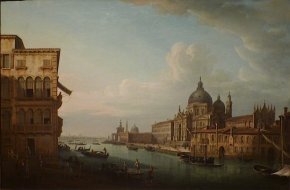 Instead of a simple and possibly monotonous Canaletto retrospective, the organisers have chosen to show his central role in 18th century Venetian landscape painting. Exhibition organiser Charles Beddington gives us a veritable lesson in art history, enabling even the most philistine to understand how this genre developed in Venice, from the first vedute identified by Gaspar Van Wittel (called Vanvitelli), which dates from 1697 (ill. 1), to the late achievements of Francesco Guardi, who died in 1793, ending a tradition that lasted just over a century (even if mediocre imitators continued until the early nineteenth century). The decision to show only attributable works of these artists, and among their best, is particularly appropriate, avoiding the feeling of boredom that could easily arise. By displaying only masterpieces, this event allows us to understand that Luca Carlevarijs (ill. 2) or Michele Marieschi, two artists often underestimated, were able to paint canvases of the highest quality. The early death of Marieschi was, as stated in the catalogue, no doubt a relief for Canaletto, ridding him of a rival who might have threatened his dominant position. The plan of the exhibition, very well laid out as is the rule at the National Gallery, traces clearly the history and evolution of the genre. 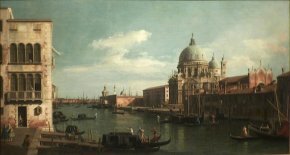 Canaletto, trained by his father, Bernardo Canal, began his career with him as a stage designer. He quickly broke out on his own and became the first view painter in the city, working almost exclusively for foreigners, foremost among them the English, who admired his skills and thus took back with them a memory of the lagoon, a major stop on the Grand Tour. Carlevarijs appears in his best works a meticulous painter, very attentive to the scenes he depicts, focusing on character studies and using the landscape itself more as a framework for the composition. Canaletto changes this orientation by focusing on Venice itself. It is exciting to see how these artists influenced each other, taking up perspectives addressed by their predecessors or competitors, with the aim, nevertheless, of finding original points of view. Carlevarijs played a major role in this process, with his series of 103 etchings executed in 1703, "Le fabriche, e Vedute di Venetia" which established a number of prototypes. Many artists painted the same views several times, but in the main Canaletto refused to repeat himself. His way of working is fully described in the catalogue, including the way he used a camera obscura to modify a view and bring all the elements into the field of array, even to falsify a perspective or shorten a campanile. Marieschi and Bellotto used the same tricks. Thus we realise all the liberties these painters could take with reality, right from the beginnings of the genre, as for example when Vanvitelli, contrary to the preparatory drawing, adds Gothic tracery to the Doge’s Palace and depicts all three domes of St Mark’s Basilica when the perspective chosen should only show one. The exhibition highlights many comparisons that illuminate the similarities and the differences between painters and constitutes a remarkable pictorial demonstration. 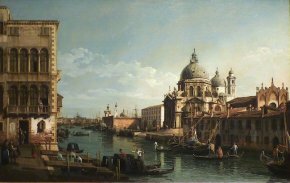 I will give but one example here : Canaletto and Bellotto, with two works representing exactly the same point of view, The entrance of the Grand Canal to the east, with Santa Maria della Salute (ill. 3 and 4) , the first dating from around 1741, the second made around 1743. Despite the difference in style, one is struck by the fact that the boats and the figures are almost all in the same places, two years apart, which clearly shows that Bellotto was not content merely to take up the perspective of Canaletto, but was directly inspired by his painting. In 1747, Bellotto left for Dresden, where he remained for eleven years, before travelling throughout Europe and ending his life in Warsaw. 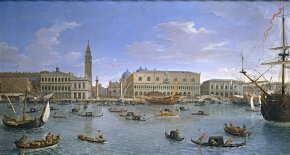 In 1748, his far less famous brother Pietro Bellotti, one of whose paintings is exhibited (ill. 5), representing once again the same view of the Salute, settled permanently in France, and Canaletto himself went to London. Between 1748 and 1755, Venice was thus deprived of all the members of the Canal family, at a time when no other important painter in the vedute genre could replace them It was not until several years after the return of Canaletto in 1755 that there appeared on the scene the Venetian who would become his last major rival, and perhaps the most famous, Francesco Guardi, who only began to paint views of the City of the Doges at the age of 40. The exhibition shows the evolution of the style of Canaletto, which, in its infancy, consisted of wispier compositions, less precise than the image we usually have of his art. Francesco Guardi thus imitated the style of Canaletto’s earlier paintings. What Bellotto owed to his uncle appears no less clearly, but it quickly gravitated towards colder colours and even more stringently architectural constructions. If one prefers the works of the nephew, one should note, however, the weakness of his figures (his dogs, for example, look like monkeys). As for Marieschi, he often used other artists to paint his human figures. The catalogue is excellent. Unexpectedly, the lack of notes does not detract from its enjoyment, the explanations being given in the painters’ biographies (we regret, however, that the technical descriptions are left to the end of the book, which obliges the reader to go back and forth unnecessarily). This exhibition will not add much new for specialists, but it is a remarkable and exemplary synthesis of this subject, which fully justifies it. Charles Beddington, with contributions from Amanda Bradley, Venice. Canaletto and his Rivals, 2010, Edition Fonds Mercator, 192 p., 19,99 £. ISBN : 9789061539674. Visitor information : The National Gallery, Trafalgar Square London WC2N 5DN. Phone : + 44 (0)20 7747 2885. Open daily from 10 to 18, friday from 10 to 21. Rates : 12 £ (reducted : 6 £).